In 1903, the Frenchman Alexandre Saint-Yves d’Alveydre (1842-1909) published an enormous work intended to be a comprehensive key permitting a survey of ancient culture. «L’Archéomètre» attempts to assess the real value of each philosophical, scientific or religious system and its place in the universal tree of science or tradition. The term «archéomètre» comes from the Greek, and means «the mass of the principle» or words to that effect. This system draws upon a series of symbols and interpretations relating to the Ark of the Covenant. On account of the many and — depending on the culture — varied mysteries surrounding the Ark of the Covenant, there are two traditions evident with d’Alveydre: an ancient Hebrew tradition on the one hand, where the Ark of the Covenant is synonymous with the «Covenant of Laws» incorporating the signs of the zodiac and the other constellations as well as the letters of the holy alphabet; and on the other a tradition of Hindu descent, in which the Covenant is honoured as the «Sanctuary of Secrets». Alongside the constellations, planets, even-numbers and musical notes, the most important symbols on the disc of «archéomètre» are the letters of a varied set of alphabets. The most diverse languages are represented, including French, Syrian, Assyrian, Samaritan, Chaldee and Arabic. Also appearing are the letters of the Holy Alphabet, reflecting the astral alphabet, although d’Alveydre uses nineteen letters instead of the traditional twenty-two — he omits three prime letters. (The number nineteen will also arise from the twelve zodiacal signs plus the seven planets.) This theme of letters and alphabets is of overriding significance because the preconditions for the combinatorial methods, central to so many esoteric systems, are thus fulfilled. The numerical basis of «archéomètre» forms a duodecimal system (system of 12) arising from a triad (3 x 4). 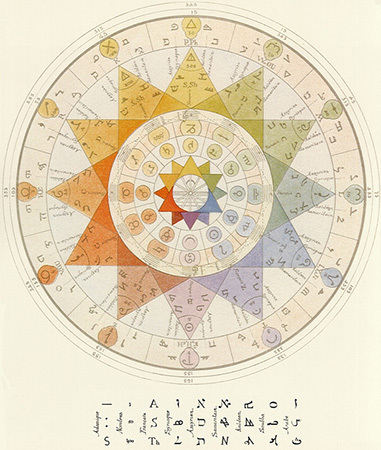 The system of «archéomètre» comprises different concentric zones of equivalents which each contain a respective messenger or medium of information — colours, planets, zodiacal signs, musical notes, letters and numbers. Its centre is formed by four superimposed equilateral triangles filling a circle and forming twelve tips, with each tip being ascribed a specific colour. The upward pointing yellow, the right-hand blue and the left-hand red tips are in the first, uppermost triangle — which represents the earth. 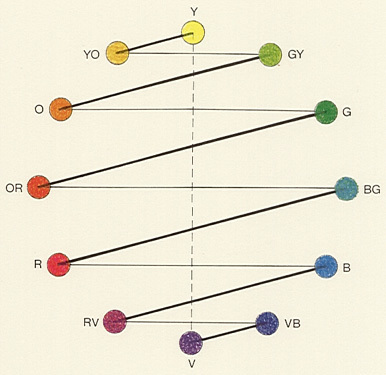 The triangle beneath, representing water (see adjacent diagram) contains violet at its lower tip (as the sum of red and blue), with orange to the left (from red and yellow) and green to the right (from yellow and blue). The air and fire triangles will emerge through rotation of both these basic triangles through 60 and 30 degrees respectively. From the colour point of view, intermediate tones are located here — products of the mixture of both the neighbouring colours. White forms the centre, and thus unity. Black, as an absence of light and therefore every colour — the kingdom of the darkness beyond — is assumed to be outside the circles which surround the «archéomètre». Astrologically, each of the three earth signs (Capricorn, Taurus and Virgo) follows each of the three fire signs (Aries, Leo and Sagittarius) counter clockwise. The air signs (Libra, Aquarius and Gemini) follow each earth sign, and the water signs (Cancer, Scorpio and Pisces) in turn follow each of the air signs. As far as allocation of the seven planets to the twelve signs of the zodiac is concerned (the so-called domain of the planets), the sun, symbolising the day, and the moon, symbolising the night, are each assigned their own domain (Leo and Cancer). With regard to the allocation of planets to the zodiacal signs, the zodiacal circle will divide into two symmetrical halves, one ruled by the sun and the other by the moon. With the exception of the moon and the sun, each planet rules over two signs of the zodiac and is associated with two colours. These are the colours of the oxides or salts of the metal associated with that particular planet, and in most cases each metal will have two oxides. The lunar (or nocturnal) Saturn — in Capricorn — corresponds to yellow, the solar (diurnal) Saturn — in Aquarius — corresponds to yellow-orange. The lunar Jupiter — in Pisces — corresponds to orange, the solar Jupiter — in Sagittarius — corresponds to green-yellow, and so forth. Of the metals, gold belongs to the sun and silver to the moon, lead to Saturn, tin to Jupiter, iron to Mars, copper to Venus and mercury to Mercury. With that, the traditional colours relate to aspects of the metals allocated to the planets. As far as the symbolism of the weekdays is concerned, the sun represents Sunday, the moon Monday, Mars Tuesday, Mercury Wednesday, Jupiter Thursday, Venus Friday and Saturn Saturday. With regard to the present-day musical notes, C belongs to Jupiter, D to Mars, E to the sun, F to Venus, G is linked to Mercury, A the moon and F to Saturn. If the circular construction of «archéomètre» is traversed in the way shown at the illustration, night will repeatedly change to day, and back to night; in other words, the diurnal and nocturnal domains of the respective planets will be crossed. Three dimensionally, the arrangement assumes the shape of a helix. The planisphere of «archéomètre» is divided into seven zones which can be read from the outer edge inwards. The first zone comprises two annular rings both marked in degrees of angle which run in opposing directions, so that the sum of any two adjacent markings on the two rings will always amount to 360 degrees. 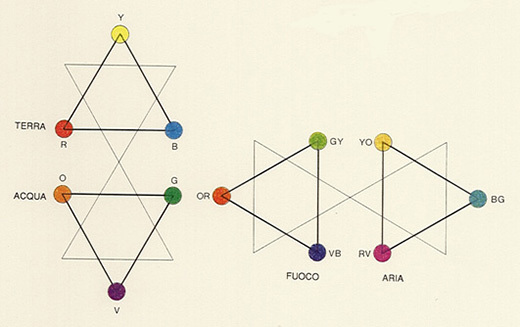 The second zone contains the modal letters — the twelve morphological letters, the twelve arithmological letters (the figures characterising the magical properties of the numbers), and the twelve colours. The third zone is mobile. It contains the ring with the twelve corners (each of which incorporates a planet), a letter from five different alphabets, a figure and a colour, as well as the colourless ring containing the musical notes. The fourth, in this case fixed, zone contains symbols representing the twelve astrological signs — the signs of the zodiac. The fifth, once again mobile, zone incorporates the planetary signs. The sixth zone accommodates the twelve corners made up from the four overlapping equilateral triangles: twelve colours, four triangles, two hexagonals. In the seventh zone is Mi, (the central musical note) or the morphological letters ascribed to Mi. Here, there are twelve white rays and six diameters. Date: In 1903, the Frenchman Saint-Yves d’Alveydre published a huge work under the title L’Archéomètre. Bibliography: S. Y. d’Alveydre, «L’Archéomètre», Paris 1903.